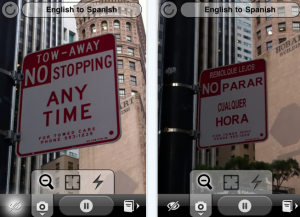 With perhaps the biggest splash of any mobile app launch, Word Lens has premiered today with great success. If you haven’t seen it already, Word Lens is a real-time, augmented reality translation service…and it will blow your mind. 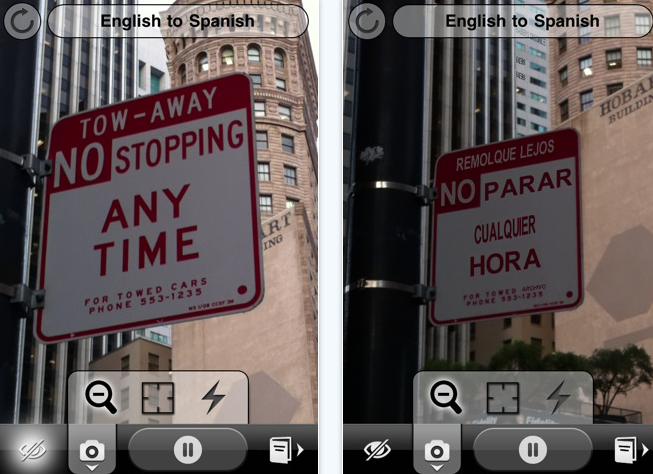 The application uses the camera function on your phone, and can translate any readable text (from English to Spanish and vice versa) right on the screen, as you view it in realtime. The translation speed is fantastic, and the accuracy is actually fairly decent. The authors themselves claim that it will not always be 100% perfect, but it can definitely give you the gist. Typically, augmented reality apps are flashy, but pretty useless and buggy. From my experience, Word Lens is anything but. The real world applications of Word Lens are boundless – for travelers and education particularly – and the app itself is actually very useable already. Don’t just take my word for it either. With so many people excited about Word Lens’ launch, it was even a Twitter Trending Topic today. The demo app is free, with the ability to read any text backwards (aka demonstrate the functionality, but nevertheless useless), and either of the language packages are $4.99. Word Lens is one of those game-changing apps that has consumer appeal and real-world application. Do yourself a favor, and go check it out now. Matt is an entrepreneur, musician, and founder of the music education startup Chromatik (www.chromatikmusic.com).